Yes. Slip and fall cases are not as straightforward as they seem. It will be your responsibility to prove that the defendant was negligent and caused your injuries. Not only would this be factually difficulty to do in a vacuum, but you must also simultaneously counter the defense of the defendant which can be legally, financially, and administratively cumbersome, to say the least. What Do I Need To Prove In An Illinois Slip And Fall Case? As previously mentioned, slip and fall causes of action in Illinois are for negligence. This means that you must show that the defendant's conduct was unreasonable in light of the circumstances. Specifically, there are four points you must illuminate: 1) the defendant owed you a duty (which is normally defined as reasonable care in Illinois slip and fall cases) 2) the defendant violated that duty 3) you suffered damages and injuries and 4) the defendant's violation was the cause of your damages and injuries. Now, in court, you must prove all four of these points beyond a preponderance of the evidence. This means that a jury must be more convinced by the plaintiff's allegations than the defendant's defenses. In criminal court, the standard is beyond a reasonable doubt and is generally presumed to require more certainty that the civil standard. How Can I Help My Chicago Attorney In A Slip And Fall Case? There are a number of things that you can do to help your attorney and better position yourself for victory in an Illinois slip and fall case. For starters, do not speak to the property owners, their attorneys, or their insurance representatives. This can put your entire recovery at risk. Next, soon after the incident, compile a list of all the people present at the scene of the accident, your impressions of it, and any questions that you have. Also, record any expenses, medical visits, or work absences that the slip and fall caused you. Finally, stay available. Your attorneys might need you throughout the entire dispute. You are the best source of information for what happened and you deserve to understand the course of developments of your lawsuit. You will only get these things if you stay on top of your legal team. How Can A Chicago Injury Attorney Help Me? Plaintiffs that use counsel normally obtain more compensation than those who don't and often by many multiples. Cases for slip and fall accidents can take as long as one or two years or even more. Slip and fall litigation takes an incredible amount of factual investigation, legal analysis, and financial resources to succeed. Many defendants in slip and fall cases are well-financed businesses or insurance companies. Plaintiffs that obtain counsel in slip and fall suits have a higher rate of success than those that do not obtain counsel. Many slip and fall cases don't go to trial but actually settle in private settlement involving complicated negotiations. 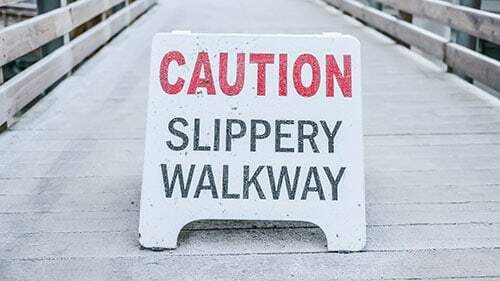 Hopefully, these important points about slip and fall lawsuits frame the question about getting a lawyer in a more comprehensive way. Naturally, if you speak with an experienced Illinois personal injury attorney, he or she can go over in great detail what they can do for your case. Do You Still Have Concerns About An Illinois Slip And Fall Claim? Every lawyer at Rosenfeld Injury Lawyers LLC strives to ensure that our clients succeed on their Illinois slip and fall claims to the fullest extent possible. To accomplish that, we work with clients according to a contingency fee agreement. That agreement states we will not charge clients for the work that we do for their Illinois slip and fall claims unless they are happy with the jury award or settlement amount that we bring them. We will give you this same promise. Contact Rosenfeld Injury Lawyers LLC today and learn how we can secure your rights.